• Saute the onions in the olive oil until the onions are translucent. Add the rest of the ingredients [except the prawns] and cook until the water is absorbed into the mixture. Let the mixture cool, cut the prawns into 1/2 inch pieces and add to the mixture Roll up about a tablespoon of the mixture in the grape leaves, remembering to turn in the ends. 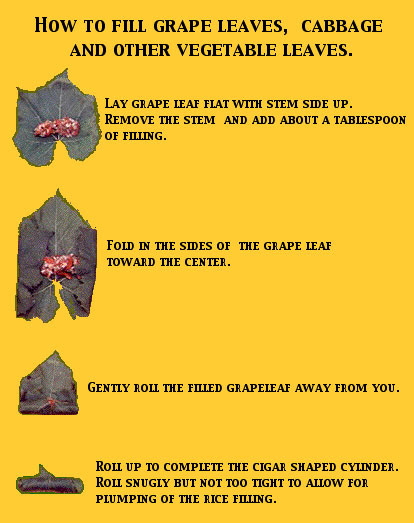 Place a few coase grape leaves on the bottom of a covered baking casserole, and place the rolled up filled grape leaves side by side in layers until all are placed. • Place a heavy plate on top of the rolled grape leaves and cover the casserole. Bake in a 350 degree oven for 45 minutes to 1 hour. When cool, if needed, drizzle a mixture of olive oil and lemon juice over the yalanchi before serving.